Horizontally boarded 57mm thick solid timber cladded external door with a styro panel core for improved thermal insulation. - Idigbo boarded 57mm thick front foor. Other timber species including Accoya, Iroko and European Oak are available (this may incur additional charges). 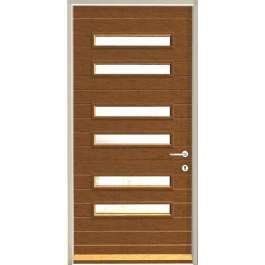 For customers with budget constraints this design of door can also be re-produced using a laminated engineered core with a ply face, engraved to the Jain design for painted finishes. This method will reduce the cost without affecting the quality or design of the door.